ARJ21 aircraft ushers in the 30,000th passenger__Commercial Aircraft Corporation of China, Ltd.
ARJ21 aircraft ushered in the 30,000th passenger on November 17th, 2017. ARJ21 aircraft ushered in the 30,000th passenger, after entering into route operation, on November 17th, 2017. ARJ21 aircraft, China's first new short-medium range turbofan regional jet which is developed in accordance with international civil aviation standards and owns independent intellectual property right, has been in commercial operation for more than one year. 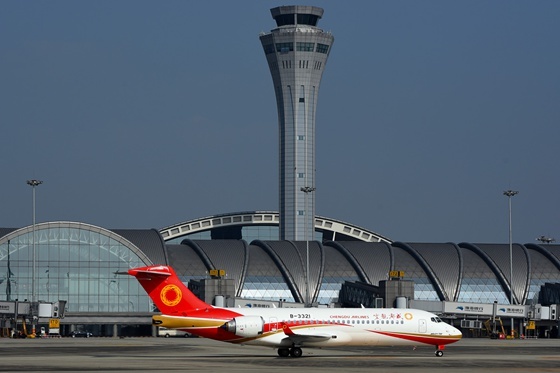 It flies the routes such as Chengdu-Changsha and Chengdu-Hefei at present. A total of 433 ARJ21 orders are obtained from 20 customers. Commercial Aircraft Corporation of China, Ltd. (COMAC) has listened to the customers' opinions and market feedback in a timely manner since the delivery for commercial operation of the first ARJ21 aircraft, constantly optimized the design while guaranteeing the smooth operation of ARJ21 aircraft, made cabin optimization and related efforts, and improved local details strictly in accordance with continued airworthiness requirements, so as to improve the experience of passengers.